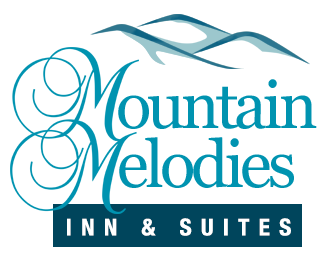 Mountain Melodies Inn boasts one of the very best locations in Pigeon Forge, TN! Our hotel is situated right on the Parkway, the main highway in the Smoky Mountain region. Guests at Mountain Melodies Inn will be just a short walk from some of the most popular places to visit in the area. To help you make the most of your vacation, we have put together a guide to five awesome attractions within walking distance of our Pigeon Forge hotel on the Parkway. The Smoky Mountain Opry is the biggest variety show in Pigeon Forge! Audience members will hear music from every decade and genre, including songs by Stevie Wonder, Frank Sinatra, The Beatles, Etta James, and Carrie Underwood. In addition to the toe tapping tunes, the Smoky Mountain Opry show also features dancing, comedy, special effects, pyrotechnics, and airborne performers. The Smoky Mountain Opry is just a 3 minute walk from Mountain Melodies Inn. WonderWorks is a unique indoor amusement park that your whole family will love! Once you step inside this iconic upside down building (and get yourself right side up again), you’ll be able to enjoy over one hundred hands on exhibits that are educational and fun. Some of the highlights of this attraction include the bubble lab, the giant piano, an astronaut training challenge, and the earthquake and hurricane simulators. WonderWorks is a 7 minute walk from Mountain Melodies Inn. It’s hard to miss the Titanic Museum Attraction when you’re driving through Pigeon Forge, since the entire building is designed to look like a giant ship! Inside the attraction, you’ll find over 400 artifacts from the actual RMS Titanic and full scale recreations of some of the ocean liner’s rooms. Whether you’re a history buff or you’re just a fan of the Titanic movie with Leonardo DiCaprio and Kate Winslet, you’ll love this museum. The Titanic Museum Attraction is an 8 minute walk from our Pigeon Forge hotel on the Parkway. Magic Beyond Belief certainly lives up to its name! This incredible magic show stars Darren Romeo, a gifted performer who was mentored by Siegfried and Roy. Known as “The Voice of Magic”, Romeo is also an accomplished singer, and he enjoys incorporating music into his illusions. After you see this show, you’ll be scratching your head for weeks trying to figure out how Romeo executed his tricks. Magic Beyond Belief is a 9 minute walk from Mountain Melodies Inn. The Hatfield & McCoy Dinner Show is a can’t-miss part of any Smoky Mountain vacation. This one of a kind show follows the Hatfield & McCoy families, who have been locked in an epic feud for an eternity. Audiences will enjoy comedy, music, stunts, and mouthwatering country cooking as the two families try to settle their differences once and for all. 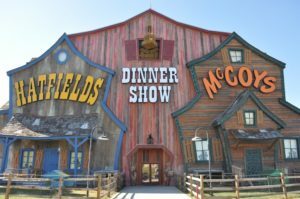 The Hatfield & McCoy Dinner Show is an 8 minute walk from Mountain Melodies Inn. After a fun day visiting some of the area’s best attractions, you will love returning to our Pigeon Forge hotel on the Parkway for some rest and relaxation. Mountain Melodies Inn has everything you need to kick back and unwind, including a seasonal outdoor pool and hot tub, free wireless internet, and rooms with balconies, Jacuzzis, and fireplaces. From the moment you start your day with our complimentary breakfast, to the second your head hits the pillow at night, your stay at Mountain Melodies Inn will be absolutely idyllic. To begin planning your next vacation, browse our selection of Pigeon Forge hotel rooms!